I usually only read self-published books when the author is someone I know or someone I know points the book out to me. Cameron Miller’s Down the Road was pointed out to me and I decided to give it a chance. 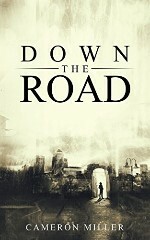 Down the Road is a short horror novel about two boys making their way through the ghettos of some city. It reads as if the author is new to the craft. There were a lot of sentences that had more words than necessary. I saw some misused words. There were structural problems in places and at times I felt the pace was too fast. But, if you can ignore the flawed writing and just pay attention to the story, you might see that Miller has promise. Storywise, I thought Down the Road was pretty good. I was especially impressed with Chapter Three. Miller detailed the fire at the inn and the reaction to it so convincingly that I thought he must have experienced a house fire himself. The rest of the story was interesting and entertaining enough, and the ending wasn’t bad. With more editing, I think Down the Road could be a great book.